Mitochondria are dynamic organelles that move along actin filaments, and serve as calcium stores in plant cells. The positioning and dynamics of mitochondria depend on membrane-cytoskeleton interactions, but it is not clear whether microfilament cytoskeleton has a direct effect on mitochondrial function and Ca2+ storage. Therefore, we designed a series of experiments to clarify the effects of actin filaments on mitochondrial Ca2+ storage, cytoplasmic Ca2+ concentration ([Ca2+]c), and the interaction between mitochondrial Ca2+ and cytoplasmic Ca2+ in Arabidopsis root hairs. 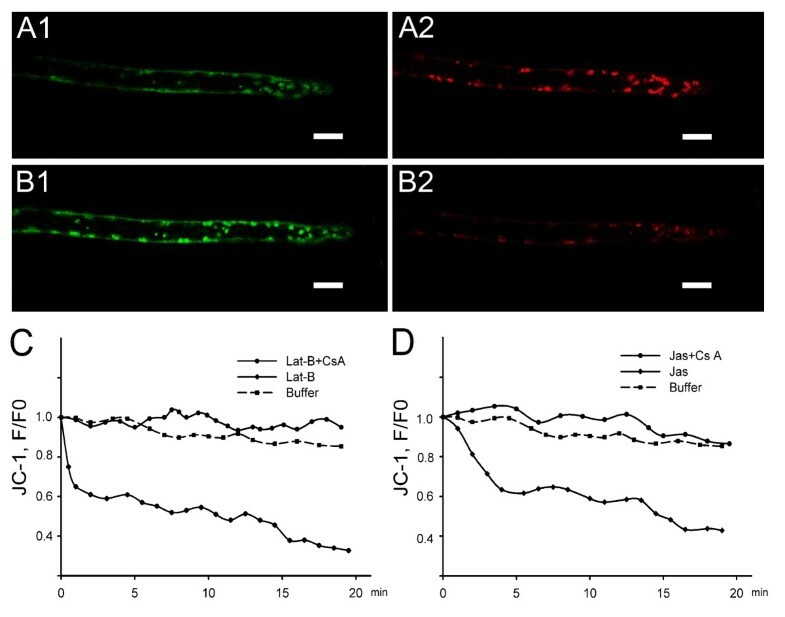 In this study, we found that treatments with latrunculin B (Lat-B) and jasplakinolide (Jas), which depolymerize and polymerize actin filaments respectively, decreased membrane potential and Ca2+ stores in the mitochondria of Arabidopsis root hairs. Simultaneously, these treatments induced an instantaneous increase of cytoplasmic Ca2+, followed by a continuous decrease. All of these effects were inhibited by pretreatment with cyclosporin A (Cs A), a representative blocker of the mitochondrial permeability transition pore (mPTP). Moreover, we found there was a Ca2+ concentration gradient in mitochondria from the tip to the base of the root hair, and this gradient could be disrupted by actin-acting drugs. Based on these results, we concluded that the disruption of actin filaments caused by Lat-B or Jas promoted irreversible opening of the mPTP, resulting in mitochondrial Ca2+ release into the cytoplasm, and consequent changes in [Ca2+]c. We suggest that normal polymerization and depolymerization of actin filaments are essential for mitochondrial Ca2+ storage in root hairs. The actin cytoskeleton is a dynamic structure that participates in many cellular functions including the maintenance of cell polarity and morphology, intracellular trafficking of organelles, cell motility, and cell division [1–4]. Light, touch, heat, hormones, pathogen attack, and many other extracellular stimuli lead to rapid structural changes of the actin cytoskeleton in plant cells [5, 6]. Actin rearrangements in response to physiological cues have been described for root hairs responding to nodulation factors from Rhizobia, and for pollen tubes responding to self-incompatibility factors [7, 8]. Increasing evidence suggests that actin filaments play an important role in cellular signal transduction [5, 9]. Agents that act on actin to disrupt microfilaments dynamics have been used to investigate downstream reactions [10, 11]. For example, latrunculins (Lat) and jasplakinolide (Jas) were used often in recent years to disrupt or stabilize actin filaments, which change the structure of the actin cytoskeleton immediately [11, 12]. At the biochemical level, Lat have a straightforward and specific mode of action, which end up in a complete shift from filamentous actin (F-actin) to globular actin (G-actin) by forming G-actin-Lat complexes . Jas stabilizes actin filaments and induces an apparent contraction of the actin cytoskeleton. In addition, Jas can disrupt actin filaments in vivo and induce the monomeric actin to polymerize into amorphous masses . 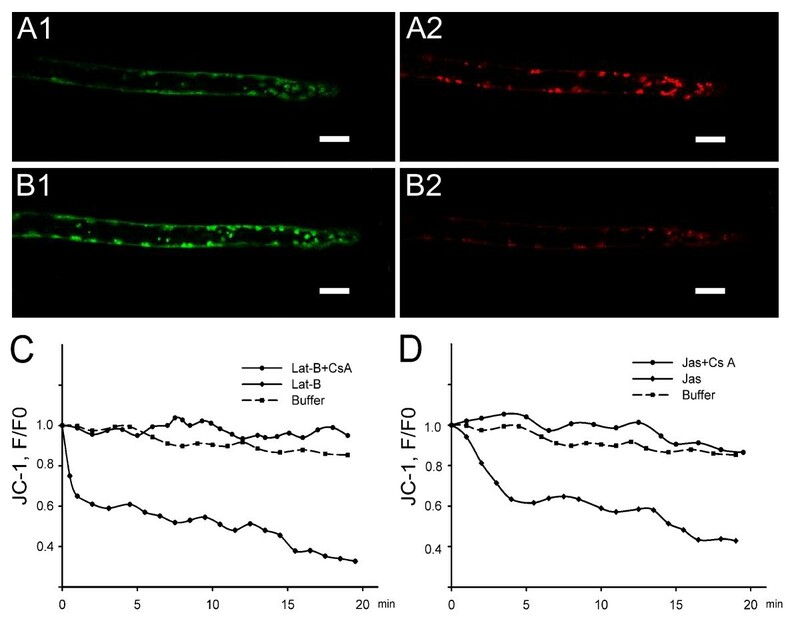 In this study, we also used latrunculin B (Lat-B) and Jas to disturb the normal dynamics of actin filaments. Free Ca2+ plays vital roles in cell development and is involved in a myriad of physiological functions. Cytoplasmic Ca2+ is mainly from an influx of extracellular Ca2+ through different plasma membrane cation channels [14, 15]. Earlier investigations demonstrated that the cytoplasmic free Ca2+ concentration, [Ca2+]c, is much lower than that outside the cell or in some inner membrane organelles . In plants, this maintenance of low [Ca2+]c mainly depends on the cell wall or cellular Ca2+ stores, such as vacuoles, the endoplasmic reticulum (ER), and mitochondria . The regulation of Ca2+ pools and the Ca2+ cycle is critical for cells and has been well studied [18, 19]. However, most research on plant cells has focused on vacuoles [20, 21] and ER [22, 23], and only a few studies have examined Ca2+ in plant mitochondria . Mitochondria are important Ca2+ stores in animal and fungal cells [25, 26]. They are constantly in motion, can undergo fission and fusion in response to cellular events, and can communicate with other Ca2+ stores . Mitochondria can move to and assemble in any cytoplasmic area where Ca2+ levels are increasing or decreasing . Mitochondria in plant cells move mainly along F-actin [29, 30], and thus interactions between mitochondrial membranes and microfilaments affect the structure and positioning of mitochondria and direct their movements. Nevertheless, it is not known whether actin filaments have an impact on the function of mitochondria. Some recent reports proposed that F-actin regulates mitochondrial motion and fission [30, 31]. Other studies have focused on Ca2+ carriers and Ca2+ channels of mitochondrial membranes in animal cells [32, 33]. Few studies have considered the effect of the disruption of microfilaments on mitochondrial Ca2+ transport across membranes . Thus, it is necessary to investigate the interaction between F-actin and mitochondrial Ca2+ storage. Some research demonstrated that mitochondrial membrane potential (Ψm) and mitochondrial permeability transition pore (mPTP) were also involved in Ca2+ homeostasis in plant cells [35, 36]. Ψm has been used as a marker for mitochondrial activity [37, 38]. Normally, active mitochondria are polarized and have a high positive potential . The mPTP is a nonselective, high conductance channel with three main components, including the voltage-dependent anion channel (VDAC in the outer mitochondrial membrane), adenine nucleotide translocase (ANT in the inner mitochondrial membrane), and the matrix protein cyclophilin D . The mPTP opening allows diffusion of solutes with a molecular mass up to about 1500 Da, and they can exist in two forms: reversible normal opening at low conductance and irreversible opening at high conductance . Some previous studies have focused on the association between mitochondrial membrane potential and mPTP [41, 42]. Normal mPTP opening was important for maintaining Ψm in animal and filamentous fungal cells [41, 43]. Studies on plant cells also showed that the mitochondrial membrane potential decreased when mPTP opened abnormally [39, 44]. Tip-growing cells represent an ideal system in which to investigate the role of the actin cytoskeleton in signal transduction . Root hairs and pollen tubes are the most familiar models for polarized tip growth. To investigate the effect of the disruption of microfilaments on mitochondrial and cytoplasmic Ca2+, we chose Arabidopsis root hairs as an experimental material. Specifically, we focused on changes in mitochondrial Ca2+ concentration ([Ca2+]m), and its relationship with [Ca2+]c, which is assumed to be linked with and essential for root hair tip growth. The purpose of this study was to evaluate the effects of disruption of actin filaments on mitochondrial Ca2+ storage, [Ca2+]c, and the interaction between mitochondrial Ca2+ and cytoplasmic Ca2+ in root hairs. In this study, fluorescent mitochondrial dyes, MitoTracker and Rhod-2, were used to visualize mitochondria and quantitate the mitochondrial Ca2+ concentration. Both cable-like or dot structures dyes labeled were highly dynamic. In elongating root hairs, mitochondrial density was uneven and mitochondrial distribution showed a sub-tip to base gradient (Figure 1A and 1B). After root hairs were incubated in 10 μM Rhod-2, and [Ca2+]m was calculated based on the fluorescence density value of Rhod-2. In most of the mitochondria, [Ca2+]m varied from 230 nM to 800 nM, and in a small number, [Ca2+]m reached 1 μM. [Ca2+]m was also unequal in different areas. 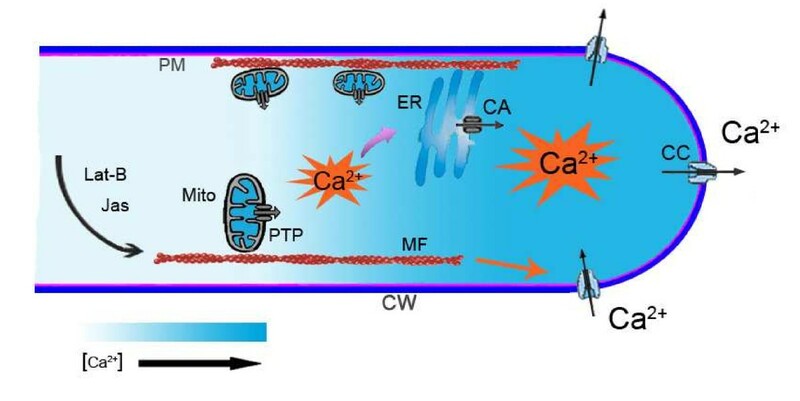 In addition, there was a calcium concentration gradient along the root hair long axis with [Ca2+] in the apical and subapical mitochondria being about twice that in mitochondria at the root hair base (Figure 1C). The gradient of [Ca 2+ ] m in root hairs was disrupted by Lat-B and Jas. (A1) Fluorescence micrograph of mitochondria (red particles) labeled with Rhod-2 in a normally growing root hair. (A2) Superimposition of the bright field image and fluorescence micrograph of the same root hair. Scale bars = 10 μm. (B) The gradient distribution of mitochondria in root hairs did not obviously change after a 10-min treatment with 500 nM Lat-B. The graph depicted the number of mitochondria from a 10-μm distance from the apex to the base region at 10-μm intervals. CK represented the measured data before treatment. (C) The gradient of [Ca2+]m in a normal root hair was disrupted after a 3-min treatment with 500 nM Lat-B. The graph showed the concentration from a 10-μm distance from the apex to the base region at 10-μm intervals. CK represented the measured data in drug-free medium before treatment. (D) The gradient of [Ca2+]m was dissipated after 3 min of treatment with Jas. CK represented the measured data in drug-free medium before treatment. (E) Decreases in [Ca2+]m in the tip, shank, and base regions of the root hair after a 10-min treatment with 500 nM Lat-B. 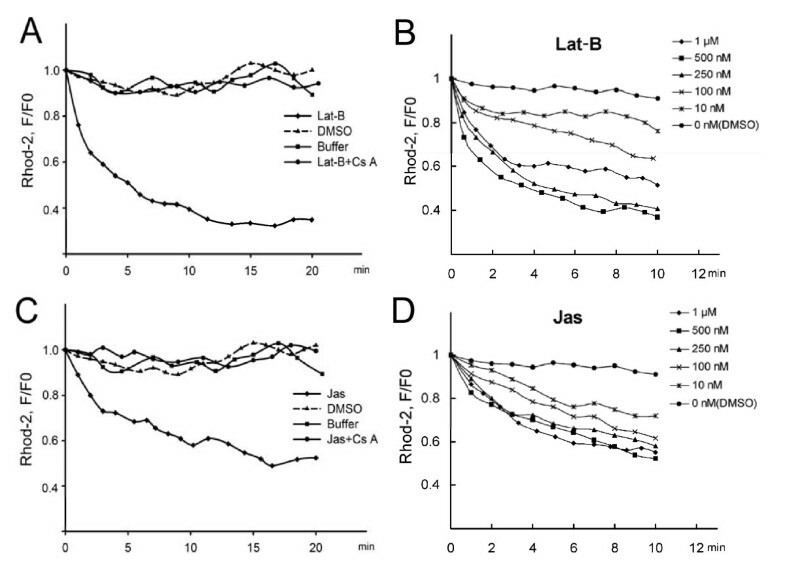 F0 represented the fluorescence intensity value of Rhod-2 before treatments, and F represented the fluorescence intensity value in same mitochondria after treatments. When root hairs were treated with 500 nM Lat-B, the distribution pattern of mitochondria did not obviously change; the mitochondrial number remained the highest in the subapical region and lowest in the base of the root hair (Figure 1B). However, the calcium concentration gradient of mitochondria in different regions of the root hair disappeared after 3 min (Figure 1C). Treatment with 250 nM Jas also dramatically disrupted the [Ca2+]m gradient (Figure 1D). The rate and magnitude of [Ca2+] decrease in apical and subapical mitochondria were greater than those of mitochondria in other areas of the root hair in the Lat-B and Jas treatments, with the [Ca2+]m decrease in the root hair tip being about 50% greater than that in the root hair base in the Lat-B treatment (Figure 1E). In normally growing root hairs, [Ca2+]m was frequently higher than 230 nM. After treatment with 500 nM Lat-B, the mitochondrial Ca2+ level decreased by 65% after 10 min (Figure 2A; see Additional File 1: Movie 1 for a original example of a series of images); with 1 μM Lat-B, the decrease was only 46% after 10 min (Figure 2B). At 10 nM Lat-B, there was a 22% decrease 10 min later (Figure 2B). 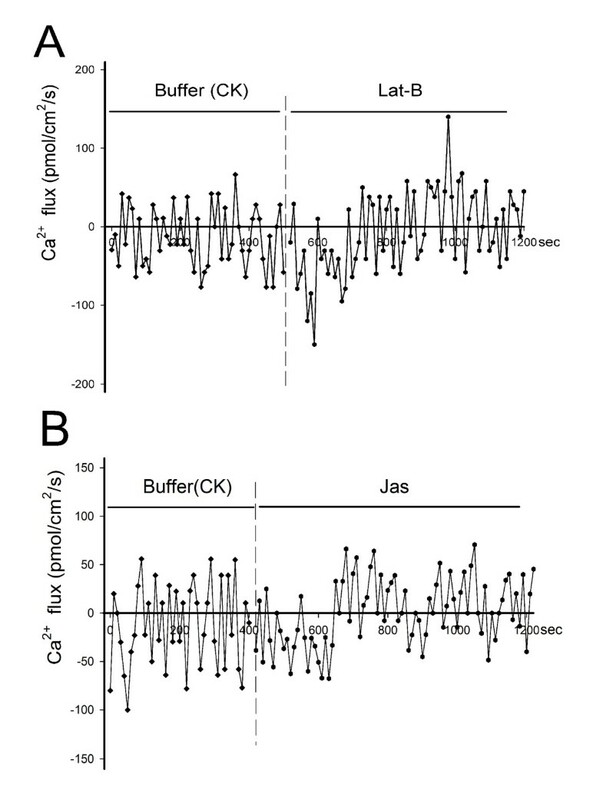 The actin stabilizer Jas induced changes similar to those seen in the Lat-B treatments, but the rate of decrease in [Ca2+]m induced by Jas was slower than that with Lat-B. For example, 500 nM Jas decreased the [Ca2+]m to 52% of the control value after 10 min of treatment (Figure 2C). When treated with lower concentrations, from 250 nM to 10 nM Jas, the rate of decrease was gradually reduced. Thus, the effects of actin drugs were dose-dependent in the 10-500 nM concentration range, with a higher drug concentration inducing a greater and longer decrease in [Ca2+]m (Figure 2B and 2D). Changes in [Ca 2+ ] m induced by Lat-B and Jas treatments. [Ca2+]m was assessed based on fluorescence intensity of Rhod-2, as described in the Methods section. (A) and (C) The diamond curve showed the decrease in [Ca2+]m induced by 500 nM actin drugs treatment with in 20 min; the triangle curve showed the DMSO vehicle control; the square curve represented the buffer control in drug-free medium; and the dotted curve showed the change in [Ca2+]m with 30-min pretreatment with 2 μM Cs A before actin drugs application. (B) and (D) The effects of actin drugs on [Ca2+]m at different concentrations. Root hairs were treated with 0 (DMSO), 10, 100, 250, 500 nM and 1 μM actin drugs for 10 min. The graphs showed the dose-dependent effect of actin drugs in the 10-500 nM concentration range on [Ca2+]m in the root hair. These data were from concentration changes of mitochondria in sub-tip area of the root hair. F0 represented the fluorescence intensity value of Rhod-2 before treatments, and F represented the fluorescence intensity value in same mitochondria after treatments. Cs A is an mPTP inhibitor used in various cell types as it can bind specifically to the membrane protein cyclophilin D of the mPTP . With a pretreatment of 2 μM Cs A for 30 min, [Ca2+]m did not change after treatment with actin drugs in comparison to that before treatment in at least six independent experiments (Figure 2A and 2C). Furthermore, the inhibitory effects of Cs A on Jas were similar to its effects on Lat-B. These results suggested that the mitochondrial Ca2+ release induced by these drugs was prevented by Cs A. The vital dye JC-1 is a fluorescent cationic dye that has been used to investigate mitochondrial membrane potential . Mitochondria with high membrane potential fluoresce red, while those with low potential fluoresce green at 488 nm laser excitation, indicating that mitochondria are polarized when shifting fluorescence emission from green to red . In the control growing root hairs, most mitochondria fluoresced red (Figure 3A1 and 3A2). The application of 500 nM Lat-B caused immediate mitochondrial depolarization, inducing the majority of JC-1 to become green (Figure 3B1 and 3B2). The ratio of red/green fluorescence decreased to 65% of the control ratio after 1 min and to 33% after 20 min (Figure 3C). Treatment with 500 nM Jas caused a change similar to, but much slower than that of Lat-B treatments, with the red/green ratio decreasing to 62% of the control value after about 5 min and to 43% after 20 min (Figure 3D). Effects of Lat-B and Jas on mitochondrial membrane potential. Mitochondrial membrane potential was assessed using the fluorescent potentiometric dye JC-1. Red particles represented mitochondria with high membrane potential, and green particles represented those with low membrane potential. (A1) Green fluorescence image of mitochondria with low membrane potential labeled with JC-1 in control root hair. (A2) Red fluorescence image of mitochondria with high membrane potential labeled with JC-1 in the same control root hair. (B1) and (B2) Green and red fluorescence images of mitochondria in the same root hair, 5 min after the addition of 500 nM Lat-B. (C) and (D) The actin-acting drugs reduced the red/green fluorescence ratio, i.e. mitochondrial membrane potential. This effect was inhibited by a 30-min pretreatment with 2 μM Cs A. The diamond curve showed the 500 nM actin drugs treatment over a 20 min period; the dotted curve showed the change in [Ca2+]m with Cs A pretreatment before actin drugs application; and the square curve represented the buffer control in drug-free medium. F represented the ratio of red/green fluorescence, and F0 represented the ratio of red/green fluorescence before treatments. All scale bars = 10 μm. The opening of mPTP was monitored by the calcein/Co2+ imaging technique . Co2+ can quench calcein fluorescence in the cytoplasm but not that in the mitochondria; thus the decrease of calcein fluorescence in mitochondria indicated the reduction of mitochondrial Ca2+ through open mPTP. 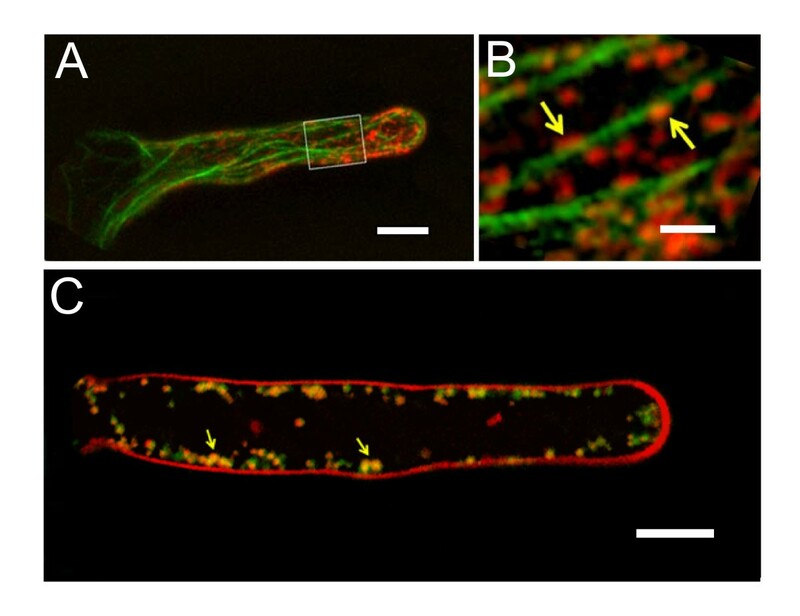 In control root hairs, mitochondria exhibited green calcein fluorescence (Figure 4A). Treatment with 500 nM Lat-B induced a loss of calcein fluorescence from the mitochondria (Figure 4B), with a decrease to about 35% of the fluorescence density before treatment within 10 min (Figure 4C). This result indicated that Co2+ entered the mitochondria after Lat-B treatment. This effect was prevented by pretreatment with the mPTP inhibitor Cs A (2 μM) (Figure 4C). The application of Jas showed similar effects to Lat-B treatments; the calcein fluorescence was reduced to 40% of the original value (data not shown). Opening of the mPTP caused by Lat-B treatment, as visualized by reduced calcein fluorescence in mitochondria. Root hair cells were loaded with calcein, and the green fluorescence represented mitochondria labeled with calcein in the root hairs. The data were representative of six independent experiments. (A) Fluorescence photograph of calcein trapped in the mitochondria in a control root hair. (B) Fluorescence image of calcein in the mitochondria after 5 min of treatment with 500 nM Lat-B in the same control root hair. (C) Changes in the fluorescence of trapped calcein over time. The diamond curve showed the decrease in calcein fluorescence induced by 500 nM Lat-B treatment in 10 min duration; the dotted curve showed the change with a 30-min pretreatment with 2 μM Cs A before Lat-B application; and the square curve represented the buffer control in drug-free medium. F0 represented the fluorescence intensity value of calcein before treatments, and F represented the fluorescence intensity value in same mitochondria after treatments. Scale bars = 10 μm. The control root hair displayed a typical tip-focused cytoplasmic Ca2+ gradient (see Additional File 2: Figure S1). When treated with 500 nM Lat-B, this gradient disappeared, i.e, [Ca2+]c showed a sharp but short elevation that lasted about 4-6 min and was followed by a continuous decrease (Figure 5A; Additional File 3: Figure S2). At lower concentrations (250 nM and 100 nM), Lat-B induced a smaller elevation of [Ca2+]c and shorter duration (Figure 5A). Compared to Lat-B, Jas treatments resulted in a slower and smaller elevation of [Ca2+]c that was not followed by a continuous reduction (Figure 5B). Interestingly, the Jas treatments with lower concentration induced [Ca2+]c elevation to a lesser extent but for a longer time (Figure 5B). Together, changes in [Ca2+]c and [Ca2+]m caused by actin drugs showed similar kinetics (Figure 5A and 5B, Figure 2A and 2C); the duration of the [Ca2+]c increase and simultaneous intense [Ca2+]m decrease were 4.5 ± 1.0 min and 5.0 ± 1.0 min, respectively. Changes in cytoplasmic [Ca 2+ ] induced by actin-acting drugs. [Ca2+]c was assessed based on the fluorescence of Calcium green-1, as described in the Methods section. All data were representative of at least four independent experiments. F0 represented the fluorescence intensity value of Calcium green-1 before treatments, and F represented the fluorescence intensity value in same root hair after treatments. (A) and (B) Changes in [Ca2+]c after the application of actin drugs at different concentrations in testing medium over a 10 min period. The intersections of the horizontal dashed line and the two vertical dashed lines indicated when [Ca2+]c decreased to a level lower than that of before treatment. (C) The effect of 100 μM La3+ on the Lat-B-induced [Ca2+]c increase as indicated by Calcium green-1 fluorescence intensity. The intersection of the horizontal and vertical dashed lines indicated when [Ca2+]c decreased to a level lower than that of before treatment. (D) Ca2+ release from internal Ca2+ stores due to the inhibition of the ER by 2 μM thapsigargin, after which Lat-B elicited a long lasting [Ca2+]c increase attributable to the opening of the mPTP. The drugs were applied for the durations indicated by the horizontal bars. The dashed line showed the start time of the Lat-B treatment. La3+ is a non-specific cation channel inhibitor that blocks plasma membrane Ca2+-permeable channels in plants. 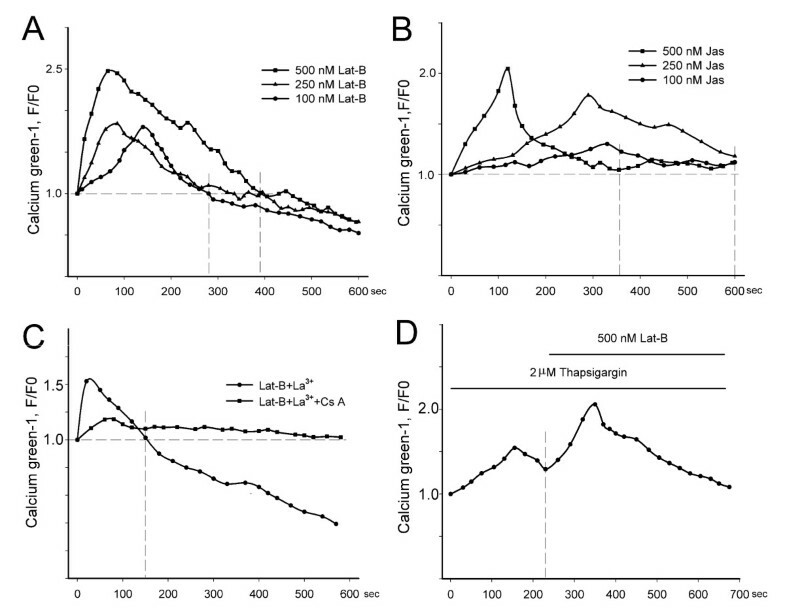 The sharp elevation in [Ca2+]c induced by Lat-B treatment was significantly weakened after extracellular Ca2+ influx was blocked by the addition of 100 μM La3+ (Figure 5C) or Ca2+-free solution (data not shown). This result indicated that Ca2+ influx played a role in the [Ca2+]c elevation induced by Lat-B treatment. Thapsigargin, a specific inhibitor of the ER Ca2+-ATPase, can increase cytoplasmic Ca2+ levels . In our experiments, treatment with thapsigargin depleted the ER Ca2+ stores, as revealed by a slow [Ca2+]c increase in root hairs (Figure 5D). The subsequent addition of Lat-B produced a second lasting [Ca2+]c increase. In the presence of Cs A, thapsigargin evoked a similar transient change in [Ca2+]c, but the subsequent addition of Lat-B had no effect on [Ca2+]c (data not shown). To clarify the reason for a decrease in [Ca2+]c, we used a scanning ion-selective electrode technique (SIET), to monitor Ca2+ fluxes through the root hair surface (see Additional File 4: Figure S3). Control root hairs showed Ca2+ influx and efflux at the cell surface, and Ca2+ influx prevailed in the control hair apex (Figure 6A). This normal Ca2+ flux was disrupted by Lat-B treatments; influx occurred within the first 5 min and an obvious efflux was noted after the primary influx (Figure 6A). The Ca2+ influx intensity induced by Lat-B was 1.5-2 times that of the control, although the efflux intensity was not significantly changed. These results indicated a net Ca2+ decrease from outward flux subsequently induced by microfilaments depolymerization. The change in Ca2+ flux of cells after treatment with 250 nM Jas was similar to that in the Lat-B treatment. The obvious Ca2+ influx lasted about 4-5 min initially, at an intensity equal to that of the control influx, and was followed by a lasting outward Ca2+ flux (Figure 6B). These results were consistent with the results described above for changes in [Ca2+]c induced by Lat-B and Jas. Changes in cellular Ca 2+ influx and efflux measured in root hairs in response to actin-acting drugs treatments. The data were obtained using non-invasive scanning ion-selective electrode measurements, which were taken at predefined locations (apex of root hair), with the Ca2+ selective probe positioned 2 μm from the root hair surface. (A) Lat-B treatment induced a rapid increase in extracellular Ca2+ influx, followed by obvious net efflux after 5 min. (B) Jas treatment induced a lasting increase in extracellular Ca2+ influx within the first 5 min, followed by obvious net efflux. Positive values represent Ca2+ efflux while negative values represent influx. To further verify possible interactions among mitochondria, ER, and microfilaments, these cellular components were co-visualized under a Zeiss confocal microscope. As shown in Figure 7, mitochondria were distributed mostly along actin filaments in the root hairs (Figure 7A and 7B). When the co-localization of mitochondria and ER was observed, ER with green fluorescence overlapped mitochondria with red fluorescence, and the area of overlap was yellow after the two channel images were merged. It was evident that there was co-localization between mitochondria and ER in root hairs (Figure 7C). Based on these results, we speculated that the mitochondria, ER, and microfilaments were partly co-localized. After microfilament disruption by Lat-B, the degree of overlap between the ER and mitochondria decreased from 66% to 45%; microfilament stabilization induced a similar change in overlap, from 80% to 55%. Co-visualization of microfilaments, mitochondria, and endoplasmic reticulum. (A) Root hair transformed with 35S::GFP-FABD2 and stained with MitoTracker. Mitochondria and microfilaments were pseudo-colored red and green, respectively. Note the distribution of mitochondria along actin filaments and bundles. (B) Higher magnification of the area highlighted in (A). The arrows pointed to mitochondria anchored to microfilaments. (C) Root hair transformed with 35S::GFP5-ER and stained with MitoTracker. Mitochondria and ER were pseudo-colored red and green, respectively. The overlap was showed in yellow. Scale bars: (A and C), 10 μm; (B), 1.5 μm. Mitochondria are important Ca2+ stores and move mainly along F-actin in plant cells [29, 49]. Thus, interactions with microfilaments may affect the positioning and properties of mitochondria. Recent reports showed that F-actin regulated mitochondrial motion as well as fission and fusion [30, 38]. Yet there were few reports on the effects of the cytoskeleton on mitochondrial Ca2+ stores, or regulation of these stores. Mironov et al. demonstrated in mouse neurons that structural changes in microtubules modulated Ca2+ release from mitochondria and ER . However, to our knowledge, there are no reports on the regulation of mitochondrial calcium by the cytoskeleton in plant cells. In the present study, we observed that the pharmacological disruption of actin filaments affected not only Ca2+ influx and efflux in root hairs but also mitochondrial Ca2+ release, whereas actin polymerization induced a slower Ca2+ decrease compare with F-actin depolymerization. These data suggested a novel role of actin filaments in cellular Ca2+ homeostasis in plant cells. We found that mitochondrial Ca2+ release was non-uniform. 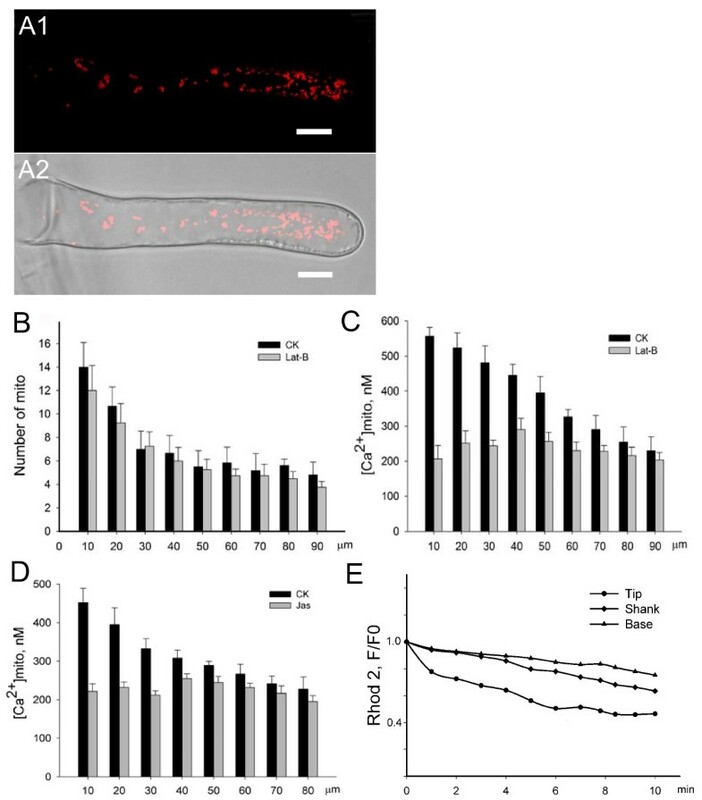 The release of Ca2+ from mitochondria in the tip and sub-tip of root hairs occurred faster than that in the shank and base. We also demonstrated an uneven and polarized distribution of mitochondria in root hairs, where the quantity of mitochondria decreased gradually from sub-tip to base. This was to some extent similar to the tip-to-base polarized distribution in other polarized cells such as neurons and fungal cells [51, 52]. Furthermore, our results revealed a concentration gradient of mitochondrial Ca2+, from tip to base of the root hairs, similar to the cytoplasmic Ca2+ gradient in the root hairs. Based on the present results and the research on motion velocity of mitochondria in Arabidopsis root hairs , we speculated that owing to mitochondria in the apical and subapical region moved the slowest, they could absorb or release more Ca2+ in the tip with high [Ca2+]c of the root hairs. Those mitochondria in the middle and base of the root hairs moved very fast in the low [Ca2+]c surroundings, and maintained a lower [Ca2+]m than mitochondria in the tip. Mitochondrial [Ca2+] was heterogeneous in cells. Collins et al. reported that mitochondria in the periphery of Hela cells sequestered more Ca2+ than those located in the perinuclear region when [Ca2+]c increased rapidly . The heterogeneity of mitochondrial [Ca2+] has not been previously investigated in plant cells. We report here for the first time that the rate of Ca2+ release from mitochondria decreased gradually from the tip to the base in Arabidopsis root hairs, although we cannot explain the precise mechanism of this phenomenon. The most probable explanation is that the F-actin anchoring mitochondria in the tip of root hairs consisted mostly of fine and short actin filaments [54, 55]; and was depolarized or polarized more quickly than the thick actin bundles in the shank or the base of the root hairs. Thus actin may act more rapidly on the outer membrane of mitochondria at the root hair tip. Another possibility is that mitochondria with high Ca2+ concentrations or those located in cellular microdomains with high [Ca2+]c could more quickly efflux Ca2+ than mitochondria with low Ca2+ concentrations or those located in other cellular microdomains with low [Ca2+]c. Thus, we conclude that the uneven Ca2+ release from mitochondria in root hairs resulted mainly from the heterogeneous distribution of F-actin and uneven [Ca2+] of mitochondria and cytoplasm in polarized root hairs. Mitochondrial membrane potential has often been used as a marker to determine mitochondrial activity, owing to the fact that normal active mitochondria are polarized with a high positive potential [37, 38]. Some studies have already investigated the relationship between F-actin and Ψm in yeast and mammalian cells [56, 57]. In yeast, a decrease in actin dynamics in certain actin mutants significantly reduced the mitochondrial membrane potential . In cultured neurons, a deficiency of the actin depolymerizing protein gelsolin promoted the loss of Ψm because of a reduction in actin dynamics . Foger et al. found that treatment of T cells with Lat-A or Jas increased or decreased mitochondrial membrane potential, respectively . Our data on plant root hairs showed that both Lat-B and Jas treatments caused a Ψm decrease. This discrepancy may be attributable to the use of different materials in the two experiments. Foger et al. used coronin-defective T cells , which have a higher F-actin content, thus Lat-A would increase rather than decrease actin dynamics in the control T cells. Therefore, it seems reasonable to conclude that reduced actin dynamics could decrease mitochondrial membrane potential. Some previous studies have focused on the association between mPTP and the cytoskeleton. Microtubule-acting drugs induced irreversible mPTP opening in mouse neurons . Early investigations demonstrated that microtubule drugs suppressed mPTP closure after overfull Ca2+-induced mPTP opening . Xu et al. found that actin could modulate the gating of VDAC in Neurospora crassa . In the present study, we found that disruption of microfilaments caused by actin-acting drugs induce irreversible mPTP opening. Given that the VDAC forms a complex with ANT in the mitochondria and interact directly with actin filaments, we speculated that conformational changes in actin filaments caused by Lat-B and Jas promote the interaction between VDAC and ANT by imposing mechanical stress on VDAC and subsequently lead to the opening of mPTP at high conductance. Indeed, a similar conclusion was reported in a study on the structural change of microtubules induced the irreversible mPTP opening in mouse neurons . Previous studies reported that the disruption of actin filaments and microtubules caused an increase or decrease in [Ca2+]c. In rat neurons, actin depolymerization and polymerization attenuated and enhanced, respectively, the increase in [Ca2+]c resulting from IP3-mediated Ca2+ release . In another study, disruption of the actin cytoskeleton with Cyto-D enhanced the parathyroid hormone (PTH) induced increase of intracellular Ca2+, whereas stabilization of actin with phalloidin prevented PTH-enhanced [Ca2+]i elevation in osteoblasts . Some studies showed that actin filaments can modify Ca2+ influx through plasma membrane Ca2+ channels in different plant cells including pollen tubes [55, 64]. Wang et al. found that actin depolymerization reagents significantly increased cytoplasmic Ca2+ levels by increasing inward Ca2+ flux through hyperpolarization-activated Ca2+ permeable channels in pollen protoplasts and pollen tubes . In the present study, we found that both actin depolymerization and polymerization induced [Ca2+]c elevation, followed by a decrease, accompanied by mitochondrial Ca2+ release. These results differed from conclusions based on investigations in pollen tubes and osteoblasts, where Lat-A and Cyto-D only increased [Ca2+]c [55, 63]. This difference may be attributable to two factors: the previous studies did not examine the condition with no extracellular Ca2+, and experimental materials were based on pollen protoplasts instead of intact root hair cells. Except for the interaction with cation channels, actin filaments also possibly interacted with Ca2+-ATPases, G-protein and Ca2+-binding proteins and then induced the [Ca2+]c elevation [65–67]. In addition, there was a possibility that mitochondria transport superoxide anions to the cytosol after mPTP opening and activate ROS-activated Ca2+-permeable channels in the plasma membrane [68, 69]. Our results showed that mitochondrial Ca2+ release and extracellular Ca2+ influx caused an increase in [Ca2+]c, and the subsequent intracellular Ca2+ efflux induced a decrease in [Ca2+]c. This conclusion was based on the following analysis: the sharp elevation in [Ca2+]c was weakened after blocking of Ca2+ influx, probably indicating that Ca2+ influx is required for the increase in [Ca2+]c except for mitochondrial Ca2+ release; and disruption of actin filaments induces the release of Ca2+ from mitochondria, which increased Ca2+ further activated the Ca2+-induced Ca2+ release (CICR) from the ER [50, 70], accompanied by extracellular Ca2+ influx. In summary, our results indicate that disruption of actin filaments promoted an interaction between mitochondrial Ca2+ and cytoplasmic Ca2+, as generalized in our model (Figure 8). Our data provided new functional evidence that the actin cytoskeleton plays an important and specific role in maintaining the mitochondrial Ca2+ buffer function by regulating the opening of the mPTP and the positioning of mitochondria close to the ER. This study has three main findings: (1) Lat-B and Jas depolarized mitochondrial membranes and induced Ca2+ release from mitochondria via the mPTP; (2) mitochondria displayed a [Ca2+] gradient from tip to base in living root hairs; and (3) actin-acting drugs first induced an increase followed by a decrease in [Ca2+]c. Based on these results, we conclude that the disruption of actin filaments induced the release of Ca2+ from mitochondria to the cytoplasm with an increase in [Ca2+]c; these increased cytoplasmic Ca2+ further induced the release of Ca2+ from the ER and caused changes in Ca2+ flux in Arabidopsis root hairs. Interactions between mitochondria, endoplasmic reticulum, and actin filaments. Mitochondria-bound microfilaments are depolymerized by Lat-B and are stabilized by Jas, and either change in the actin structure promotes the opening of mPTP. Because of the close apposition of mitochondria to ER, Ca2+ released from mitochondria can activate the Ca2+-induced Ca2+ release (CICR) mechanism in ER, which triggers spontaneous [Ca2+]c spikes. The disruption of actin filaments also induces an increase in Ca2+ influx at the root hair surface. The signal of Ca2+ increase in the cytoplasm triggers final Ca2+ efflux. Mito, mitochondria; ER, endoplasmic reticulum; MF, microfilaments; CW, cell wall; PM, protoplasm membrane; PTP, permeability transition pore; CA, Ca2+-ATPase, CC, Ca2+-channel. Seeds of Arabidopsis thaliana (Columbia 0) were surface sterilized, germinated on 1/2 MS medium supplemented with 0.1% (w/v) sucrose and 0.7% (w/v) plant agar, and grown at 22°C with a light/dark cycle of 16/8 h. The seedlings grew for 3-4 days and were chosen for experiments when roots were 1-2 cm long. All dyes were from Invitrogen (Carlsbad, CA, USA). Plants were incubated at 4°C in the dark for 30 min with one of the following dyes: 10 μM Rhod-2/AM (Rhod-2), 2 μg/ml JC-1, and 1 μM calcein/AM (calcein); or for 1 h with 1 μM Fluo-4/AM, or for 15 min with 100 nM MitoTracker. The incubation with Fluo-4/AM was at 4°C and followed the method of Zhang . Mitochondria and ER were co-visualized using MitoTracker and the 35S::mGFP5-ER construct in transformed plants. Mitochondria and microfilaments were co-localized using MitoTracker and the 35S::GFP-FABD2 construct in transformed plants, respectively. After the plants were loaded with dyes, they were kept in dye-free medium for at least 30 min before starting the experiments. The root hairs were viewed under a 63× water immersion objective. When scanning the fluorescence of mitochondria, we used Z-stacks scanning to detect the root hairs with normal streaming. Before treatment, the position of an individual slide was fixed and noted in the object stage, the buffer below the cover glass was absorbed with thin filter paper and the drugs were added gently with a 10 μL micropipettor. Images were collected before and after treatment respectively. Images obtained using a confocal laser microscope (Zeiss 510 Meta, Jena, Germany) were digitized at 8-bit resolution and analyzed using LSM 5 Image Browser or Image J software. Digital images were acquired every 5-10 s, and the average fluorescence intensities of all relevant regions were recorded and stored for subsequent analysis. Wide field fluorescence images were collected with exposure times of between 100 ms and 300 ms. The fluorescence of Fluo-4, Calcium green-1, calcein, and JC-1 were imaged using a 488 nm laser line for excitation, and the fluorescence was isolated using a dichroic mirror with mid-reflection at 505 nm and an emission filter (535 ± 15 nm). For Rhod-2, the emission was collected using a 535 nm primary dichroic mirror and the Meta-detector of the microscope. The fluorescence patterns of Rhod-2 and JC-1 in root hairs showed punctuate structures representing individual mitochondria or their aggregates. Fluorescence intensity was measured in 1 μm-diameter regions of interest encircling the bright spots corresponding to mitochondria. The signals from 4-6 mitochondria within a cell were averaged. These observations were repeated 6-8 times in different Arabidopsis plants, i.e. 6-8 root hairs selected randomly. Except for the analysis of density and concentration differences of the mitochondria from different regions of the root hairs, other data on mitochondria were obtained from the whole root hair rather than from certain specific region of the root hair. Before each experiment, root hair morphology and vitality were observed using transmitted light to ensure that normal cytoplasmic streaming was present in the growing root hairs. Each test was repeated at least three times for each root hair developmental period. The Ca2+-sensitive fluorescent probes Fluo-4/AM ester and Calcium green-1-10-kDa dextran were used to measure [Ca2+]c in the root hairs. The latter Calcium green-1 was microinjected into the root hairs. Under an Axiovert 200 M inverted microscope (Eppendorf TransferMan NK2, Hamburg, Germany), root hairs were impaled with micropipettes, pulled from filament electrode glass using a PC-84 puller (Sutter Instruments, Novato, CA, USA), that contained 0.5 mM dextran-conjugated dye. The dye was then pressure-injected into the root hair base on the microscope. The injected cells were allowed to recover for 30 min prior to imaging after the microinjection. The long-wavelength calcium indicator Rhod-2 with net positive charge was used to measure [Ca2+]m in the root hairs. [Ca2+] was calculated according to the following formula: [Ca2+] = Kd * (F - Fmin)/(Fmax - F), where F is the fluorescence of the indicator at the experimental Ca2+ levels, Fmin is the fluorescence in the absence of Ca2+ and Fmax is the fluorescence of the Ca2+-saturated probe. In the Fluo-4 and Calcium green-1 labeling experiments, each single measurement of the Fmax value was determined by addition of 2 μM ionomycin and 5 mM Ca2+, and the Fmin value was determined by addition of 5 mM EGTA, where the Kd of Fluo-4 was 345 nM and that of Calcium green-1 was 190 nM [72, 73]. In Rhod-2 labeling experiments, every measurement of the Fmax value was determined by addition of 2 μM ionomycin and 2 mM Mn2+, and the Fmin value was determined by addition of 5 mM EGTA, where the Kd of Rhod-2 was 570 nM . All chemicals were purchased from Sigma (St. Louis, MO, USA) unless otherwise indicated. Stock concentrations of 1 mM Lat-B, 100 μM Jas, and 2 mM Cs A were prepared in DMSO. The working concentrations were as follows: 10-1000 nM Lat-B, 10-1000 nM Jas, and 2 μM Cs A. The working solutions were carefully added to the samples labeled with dye when taking photos. Cs A was added to the samples and treated 30 min after the dye loading, and fluorescence was collected after washout. Yuqing Wang, Yingfang Zhu contributed equally to this work. YW and JL designed the study, YW and YZ carried out the experiments and the quantitative image analysis, and drafted the manuscript. YL carried out the experiment of cytosolic Ca2+ labeling. HZ offered the guidance for experimental design. PL provided the data analysis and figures drawing supports. FB and JS offered the transgenic plant seeds and co-localization figure and analysis, and revised the manuscript. JL provided support and general guidance for this work. QW conceived of the study and results analysis, and guided for writing the manuscript. All authors read and approved the final manuscript.